1. Wash and soak glutinous rice overnight. 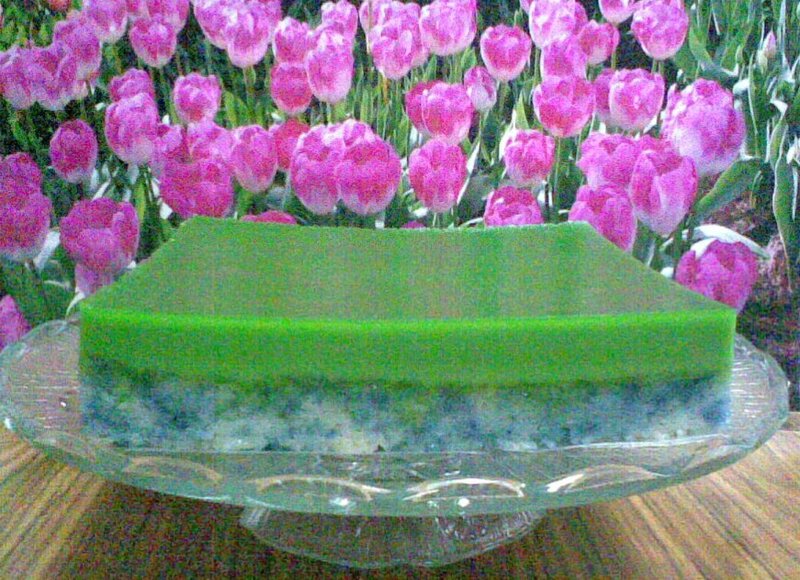 Drain and place rice in a steaming tray, top with pandan leaves and steam over high heat for 15 minutes. 2. Add 300ml thin coconut milk to steamed rice, mix well and steam for another 10 minutes. Add the thick coconut milk, mix well then sprinkle rice with some blue colouring and steam for a further 5 minutes. 3. Line the bottom of a 28 cm round tray with banana leaf. Transfer steamed rice to tray and press rice down firmly with a piece of banana leaf or a plastic spatula. Steam tray of glutinous rice over boiling water for 15 minutes before adding the custard topping. 1. Stir eggs with sugar till sugar dissolves and strain into a double boiler. 2. Sift rice flour and plain flour into a big bowl, add coconut milk gradually and mix to a smooth batter then strain into the egg mixture. Add salt, pandan juice and green colouring and stir well. 3. Stir mixture over a pot of boiling water till it coats the back of a wooden spoon. 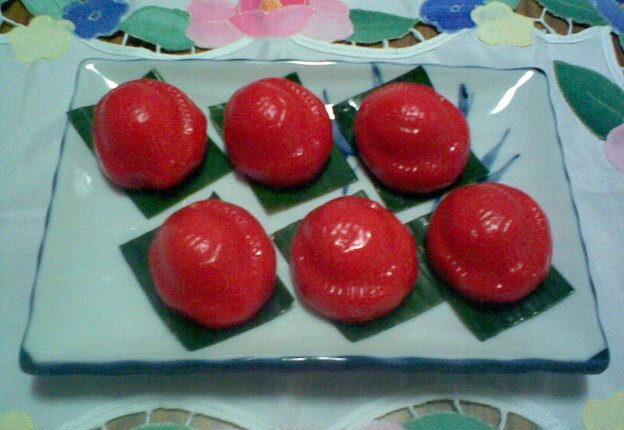 Pour custard onto steamed glutinous rice, cover and steam over moderately high heat for 15 minutes. 4. Reduce heat to low and continue to steam for another 1/2 hour or till a small stick comes out clean when inserted into the centre of the custard. Remove and place tray on a wire rack to cool completely before cutting. 1. Mix ground peanuts with sugar and add in some water to make into a paste form. Shape into small round balls of filling for dough. 1. Steam cut sweet potatoes for 10-15 minutes till cooked and soft. Mash through a wire sieve and set aside. 2. Sieve glutinous rice flour into a mixing bowl. Make a hole in centre of flour and add the sugar, mashed sweet potatoes and corn oil. Add the coloured water a little at a time and mix and knead well until the colouring is even and dough is pliable. If dough is too dry, add a little more water. Knead till dough does not stick to the hands adding more oil if necessary. Let dough rest for 20-30 minutes. 3. Divide dough into equal portions to fit mould and roll each into a round ball. Flatten each ball of dough slightly and add a small ball of filling. Pinch and seal the edges to enclose the filling. 4. 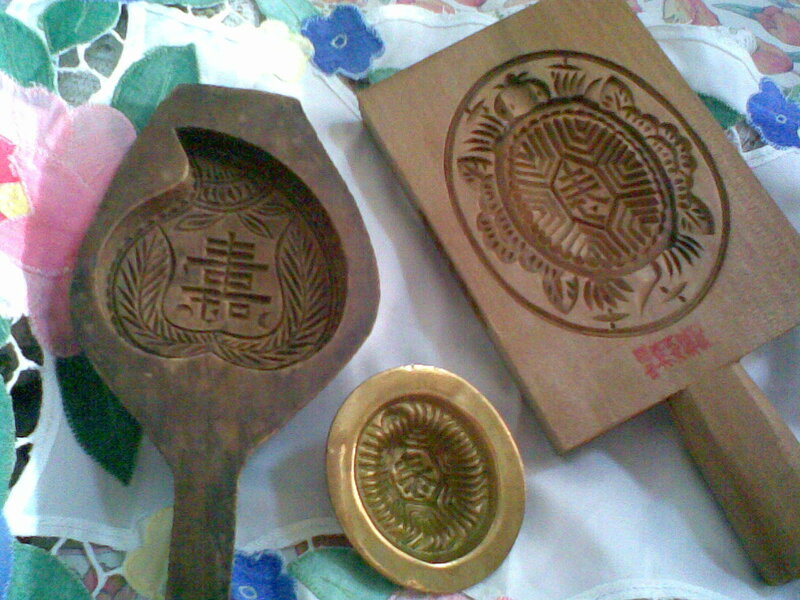 Spread some oil over the dough and press into a kueh ku mould. Knock mould lightly to dislodge kueh and place on a piece of banana leaf . 5. Place all the kueh ku in a steamer and steam on high heat for 5 minutes. Remove lid from steamer to let out excess steam. Cover and continue steaming for another 5 minutes. 6. Remove kueh ku from steamer and brush lightly with corn oil to prevent sticking. Cover with banana leaves to keep them soft. 1. Sift rice flour and cornflour into a big pot. Add 1.5 litres of water and mix well. 2. Add sugar, salt, vetsin and pepper powder. Cook mixture over low heat for about 15 to 20 minutes, stirring constantly until mixture thickens. 3. 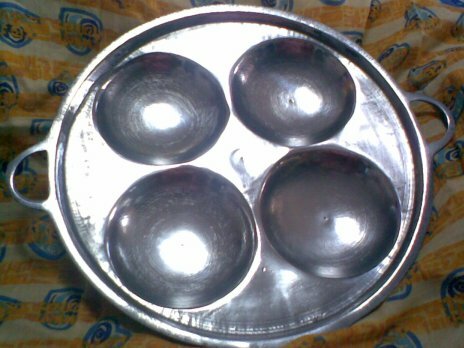 Pour mixture into a greased round tray and steam over high heat for 15 to 20 minutes or until cooked. 4. 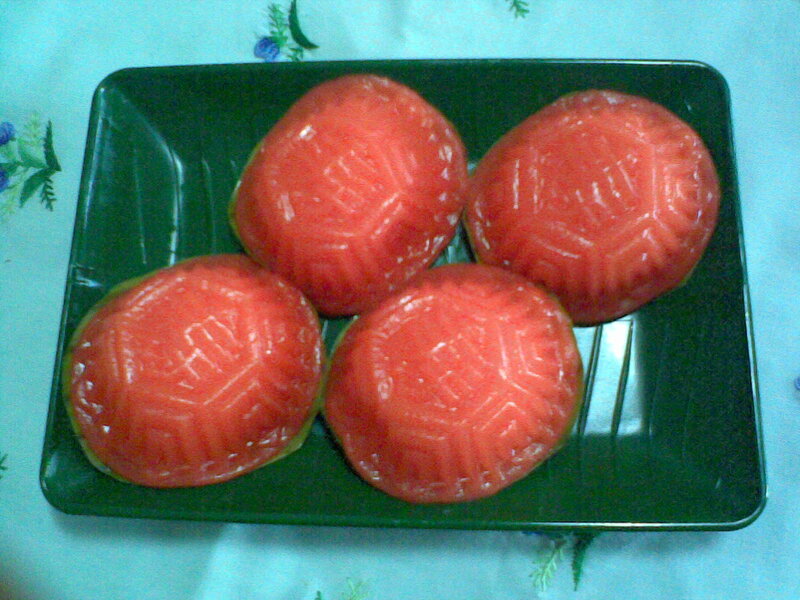 Remove from the steamer and quickly spread the filling on top of the kueh talam. Leave to cool before serving. 1. Wash dried prawns, drain and blend fine. Remove seeds from chillies and slice. Cut spring onions into cubes. 2. Heat the 6 tbsp oil in a wok and fry the sliced shallots and pounded garlic until fragrant. 3. Add the blended dried prawns and fry again until fragrant. Add the seasoning and fry for a while more. 4. Lastly, add the sliced red chillies and spring onions. Dish up and set aside for later use. 1. Wash and blend pandan leaves with the 250ml water and strain out the juice. 2. Sift rice flour, plain flour, salt and baking powder into a mixing bowl. 3. Mix sugar, eggs and durian puree with 150ml thick coconut milk. Stir till sugar dissolves. egg mixture. Mix well and strain mixture. 5. 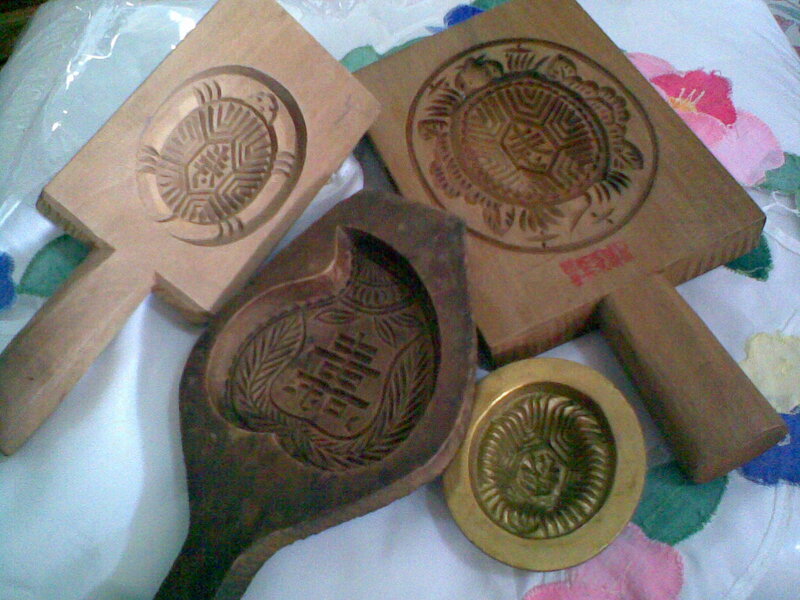 Heat an apom balik mould or a kwali until hot. Reduce the heat and grease slightly with oil. 6. Pour the batter into the mould. Cook over low heat, uncovered, until bubbles appear on the top. Cover with a lid and cook until the apom balik turns golden brown. 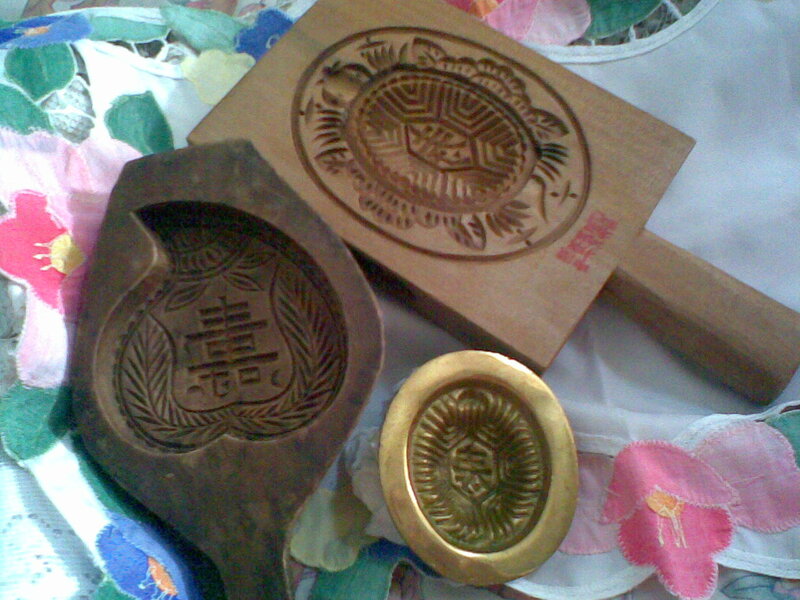 Remove from mould and fold the apom balik into half. 1. Mix rice flour and tapioca flour with 625ml water. Add in the alkaline water, stir well and strain mixture. 2. Boil sugar, gula melaka and pandan leaves with 625ml water. 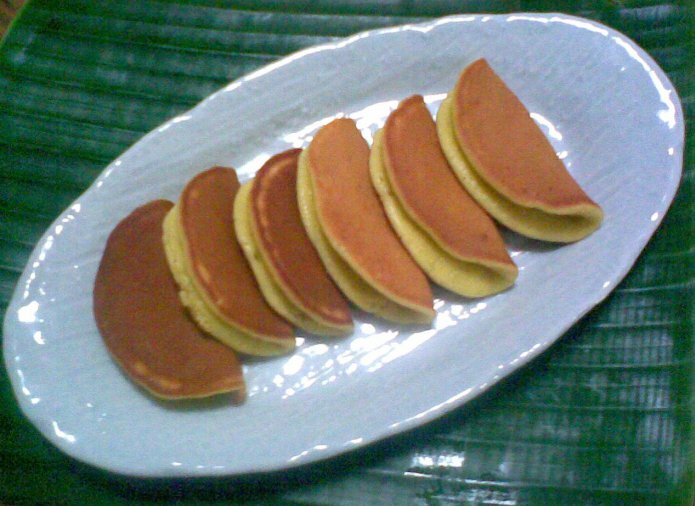 When sugar has dissolved, remove pandan leaves and strain syrup. 3. Pour the boiling syrup into the flour mixture and stir thoroughly with a wooden spoon until mixture is smooth. 4. Heat small porcelain cups or a greased square tin in steamer. 5. Pour the mixture into the heated cups and steam over a strong flame for 7-10 minutes. 6. Cool kueh before removing them carefully from the cups. 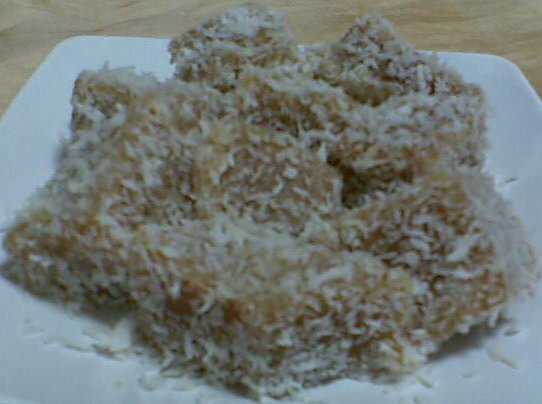 Roll kueh in grated coconut steamed with a pinch of salt and pandan leaves. 1. Remove 100g of glutinous rice flour and boil with 100ml water till of a thick paste. 2. Boil coconut milk with a pinch of salt and pandan leaves and set aside to cool. 3. Sift the remaining 500g glutinous rice flour onto table. Add the sugar and red colouring, mix well and add the coconut milk gradually. Mix well and knead for a while, then add in the cooked dough. Knead again adding the oil gradually and knead until dough is pliable and smooth. Rest dough for 30 minutes. 4. Divide dough into even portions depending on the mould you are using. 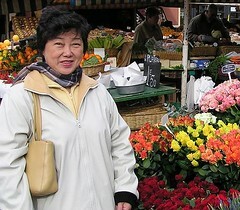 For each kueh ku, the quantity of the dough and the filling should be the same. 5. Clean banana leaves and cut into pieces slightly bigger than the mould because the leaves will shrink when steamed. 6. Flatten each piece of dough to form a thin skin and wrap with a ball of tau sah. Press the dough ball into the mould, knock the mould gently to dislodge the kueh ku and place it on a piece of banana leaf. 7. Steam kueh koo over medium heat for 8-10 minutes. 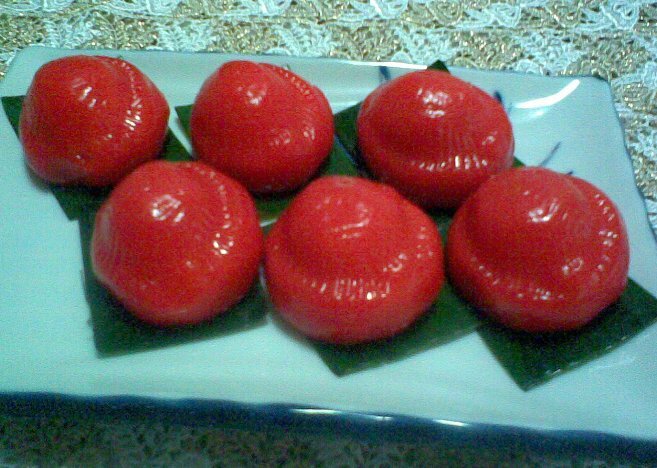 Remove the steamer lid to let out excess steam in between steaming time so that you will have a nicely shaped kueh ku. When cooked, remove and brush with a little oil to prevent sticking. 1. Wash and soak green beans for 4-5 hours. 2. Drain beans and place in steamer lined with a piece of cloth. Add pandan leaves and steam over high heat for 30-40 minutes or until beans are cooked. 3. Whilst hot, blend beans till fine or they will harden when cooled down. 4. Boil sugar with 300ml water and pandan leaves till sugar dissolves. Add in the ground beans and continue to cook over slow fire, stirring constantly, until dry and rollable. Leave to cool before using. 1. Prepare beans as for Sweet Bean Paste. (step 1 to 3). 2. Fry sliced shallots in the cooking oil until golden brown, drain and set aside. 3. Fry the ginger pulp in the onion oil until fragrant, add ground pepper and fry for a while more. 4. Add ginger juice, salt, sugar, water and mashed bean paste. Continue to fry over slow fire until dry then add in the fried shallots. 5. Leave to cool before using as filling. 1. Mix ingredient A together and set aside. 2. Place ingredient B into a pot and bring to a boil. 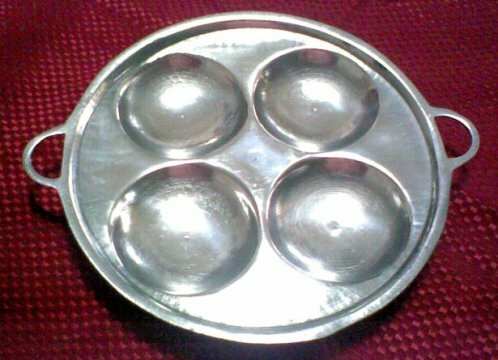 Stir continuously till sugar and agar agar powder dissolves. Turn off the heat. 3. Pour ingredient A into agar agar mixture. Turn on medium heat and stir continuously till mixture is transparent and glossy in appearance. Turn off the heat and divide mixture into two portions. 4. Rinse a seven-inch square mould. Pour one portion of mixture into mould to set. 5. To remaining portion, add in ingredient C and stir well. Spoon mixture carefully on top of first layer. 6. Level the surface and leave to set. When thoroughly cooled, remove from mould and cut into serving pieces. 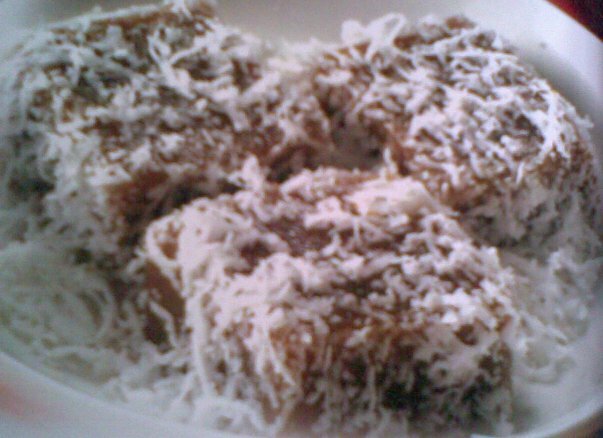 Chill kueh before serving. 1. Mix rice flour with hunkwei flour (green bean flour), salt and sugar. 2. Add 400ml coconut milk and mix well, sieve mixture. 3. Boil remaining 600ml coconut milk. When boiled, pour into the flour mixture and stir well. Add in chopped nangka (jackfruits). 4. Pour mixture into a greased, preheated 10-inch square tin. Steam over high heat for about 30 minutes or until cooked. 1. Mix eggs with sugar and stir gently until sugar dissolves. 2. Mix flour with coconut milk and add a pinch of salt. Add to the egg mixture, stir well and sieve. 3. Stir custard over a pot of boiling water until mixture thickens slightly. Pour on top of steamed Bottom Layer and steam over a medium flame for about 35-40 minutes. Cool pudding thoroughly before cutting. 1. Mix eggs with sugar and stir for few minutes. Add in sieved flour, cool melted buter, salt and vanilla essence and mix well. 2. Mix in coconut milk, a little at a time, stirring until mixture is smooth. Add a few drops of yellow colouring and strain the mixture. 3. Grease and line a 9″x9″ square baking tin with greaseproof paper. 4. Pour mixture into preheated tin and bake in a moderate oven at 180 deg C for about 1 hour. Lower temperature to finish baking. 1. Stir the eggs with the sugar until sugar dissolves. 2. Add in the sifted rice flour and custard powder, salt, coconut milk and durian meat. Mix well. 3. Pour into a greased cake tin and bake in a preheated oven at 180 deg C for 1 hour. 1. Boil coconut milk with sugar, salt and pandan leaves till sugar dissolves. Remove from heat and set aside to cool. 2. Sieve starch flour with rice flour into a mixing bowl, add in warm coconut milk and mix well. Sieve flour mixture to get a smooth batter. 3. Divide batter into 3 portions, colour 1 portion green, 1 portion red, leave remaining portion uncoloured. 4. Steam batter layer by layer beginning with white batter followed by green and red batter. 5. Pour 200ml of plain batter into a greased and preheated 8″x8″ square tin. Steam over boiling water for about 5 minutes till layer is transparent. Repeat the layering and steaming till all batter is used up. 6. After pouring in the last layer, steam for 15 minutes to cook through. Uncover the steamer during the last 5 minutes for the kueh surface to dry up. Leave to cool for a few hours before cutting into serving pieces.